I loved this race! Loved. All women. Awesome vibe. The Expert and I loaded up the car and headed out of the house around 4:50, and arrived in Acworth around 6:00. We got lost. Found our way to the race site about 6:45, which made me a complete basketcase (because I had a half mile walk to the transition area, I had no race packet or timing chip, and I had to visit the potties, and I have never used the TriTats before and and and and…). 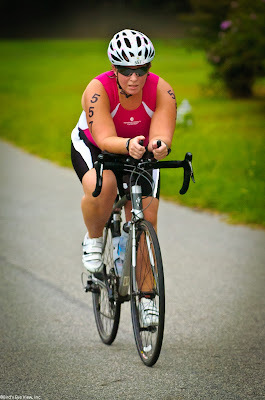 Potty break(s), transition set up, TriTats, and race numbers later, I was wandering into the lake to warm-up. What a great day for a race. I was in the next to last wave. I was racing Athena, but also age group – they blended the Brick House ladies in with the AG’ers. As I was waiting for the pink cap wave to start, a Swim Bike Mom friend recognized me and introduced herself. Amber and I had a nice quick photo courtesy ‘o the Expert, and got ready to hit the water. I tell you…something about racing an all-women’s race is so amazing. Powerful, fun and less-pressure somehow. I saw so many awesome ladies – all shapes and sizes. I watched the other waves run into the water and take off on the 400 yard course. I wasn’t really nervous per se… more like ready to get a move on. Watching wave after wave is draining in itself. I think the first wave took off about 7:30,and my wave reached the start line about 7:50. And we were off. I started off way too far to the left and probably flopped down into the water a little too soon, so I got a little clogged up in some of the other swimmers. The lake was warm and the course was great and clearly marked. I think I managed a pretty fast swim. I was suffering a little, so I knew it was as good as I could have done. The run from the sand to the bikes is always fun. Ha. T1 was fast. 1:48 or so. Before I knew it, I was out on the bike. I felt great. The sky was overcast, and perfect race weather. The course was 13 miles of rolling hills. After last week at Red Top Roaster, I didn’t think the hills were that bad. I tell you, this would be the best beginner race in the world. The downhills were lots of fun, very fast. 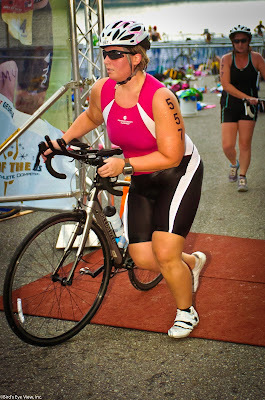 Coming out of T2, I heard the Expert yell: “Run and done, baby! Run and done! !” Ugh, I thought. I am done… don’t want to run. Tough uphill right out the gate. Oh, I was in the hurt locker on the first mile. I wasn’t impressing anyone with my run pace. Lawd, I am so slow. I did put the hammer down on the bike, and I could feel that by the time I hit mile 2. Overall, this race was awesome!! Had a super fun time, and the weather was nice. My back tire went flat on the ride to the car…. just dodged that bullet. Only a few minutes made a difference between a great race and a rotten one. I guess that’s the way it goes. Congrats to Amber and all of my other SBM friends who competed in this race and others over the weekend. Is tomorrow really Monday? Boooooooo. Damn girl! Those are some awesome times. Congrats! Hey, where did you get what you swam in? Great race! I too was lucky enough to have an overcast sky I love that! Keep up the hard work! Way to go Mere, great race! I love how casual you were about it, great approach for a sprint & nice time too (holy fast bike!). Love your tri suit, and may I say you are looking mighty fit in it?